Juan Carlos Ferrero Donat (born February 12, 1980) is a Spanish retired professional tennis player. He won the French Open in 2003. Ferrero was ranked world number 1 from September 8 to November 2 in the same year. 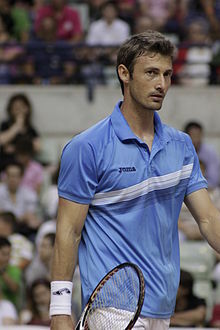 Wikimedia Commons has media related to Juan Carlos Ferrero. This page was last changed on 17 April 2019, at 15:26.